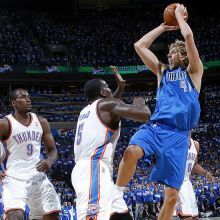 After a late-game scare, when their 23-point lead was cut down to 6, the Dallas Mavericks clung to a 93-87 win over rthe Oklahoma City Thunder to take Game 3 of the Western Conference finals. Saturday night's thriller at the Oklahoma City Arena gave Dallas a 2-1 lead in their best-of-7 series and pushed the Mavericks to within two games from this year's NBA Finals. Dirk Nowitzki had a rare night off --- 18 points on 7 for 21 shooting -- but he delivered clutch buckets in the final minutes to help Dallas ward off a pesky Thunder. Shawn Marion belted a performance that harkened back to his days as "The Matrix" in Phoenix, finishing with 18 points that helped fuel the Mavs' 27-12 start, Jason Kidd and Jason Terry chipped in 13 each for the Mavs, who shot 36 of 82 field goals and 7-of-21 3s. And Tyson Chandler manned the middled with authority, 15 rebounds and 8 points. The Mavs were beaten off the boards, 45-37, but they fired more assists, 21-11. Unlike their Game 2 upset win in Dallas, the Oklahoma reserves faltered in Game 3, scoring just 16. Kevin Durant, like Nowitzki, diidn't have a superstar night. The reigning NBA scoring champion struggled with 24 points and missed 15 of 22 shots, including 8 from 3-point range. Russell Westbrook exploded for 30 points, but was hounded by 7 turnovers against 4 assists. Overall, the Thunder converted just 36.5 percent of their shots (27-of-72). They sank 32 of 36 free throws, but they clanked 17 of 18 beyond the arc.